Based Upon Availability is the story of eight women, each exploring the basic need for human connection while seeking to understand themselves better. They are lonely, strong and driven women who, when pushed to the edge, must fight for their lives as they struggle to become the women they wish to be. Meet Trish, a gallery owner struggling to deal with the wedding and the dramatic weight loss of her best friend, changes that lead her down a self-destruction path; Robin, a realtor, who, after experiencing a lifetime of abuse by her older sister, is forced to take revenge; Anne, a lonely, single woman who suffers from obsessive-compulsive disorder, and searches for normalcy and love; Louise, a drug-addicted rock star, who is sent away to dry out by her just as famous publicist; Franny, a Southerner turned wanna-be Manhattanite, who is envious of her neighbors’ lives and their nesting habits and becomes unhealthily attached to them; Sheila, a single teacher who is driven to punish her boyfriend when he informs her he’s returning to his wife; and Ellen, a married, childless woman so desperate to have children she insists she’s pregnant. Morgan, a manager at the swanky Four Seasons in Manhattan—who is haunted by the memory of her dead sister—is the thread who weaves these women together. The hotel offers sanctuary to each—for an hour, for several days—and while some find solace, others find only despair. Strauss portrays nuanced portraits of these seemingly ordinary women to create an utterly original read, filled with dark themes and light prose. 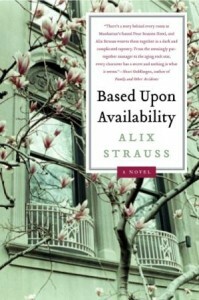 Alix Strauss has been a featured lifestyle and trend writer on national morning and talk shows. Her articles cover a range of topics and have appeared in The New York Times, Time, Entertainment Weekly, Esquire and Departures, among others. Her other books include the award-winning collection of shorts, The Joy of Funerals, an anthology of blind date horror stories Have I Got a Guy For You, and most recently, Death Becomes Them: Unearthing the Suicides of the Brilliant, the Famous and the Notorious. Thursday, July 8th: Hey Lady! Whatcha Readin’? If you’re still looking for tour hosts, I’d love to review Based Upon Availability on Starting Fresh.